Hello! Today I have my July Christmas Cards to share with you. As most of you already know, I play the Christmas Card Challenge on Splitcoaststampers where we make Christmas Cards all year long so that we're not stressed out during the busy holiday season. I make about four Christmas Cards a month so that I'll have about fifty cards at the end of the year. This month I used all vintage images from Crafty Secrets because it's a busy month for me with another vacation to prepare for, gardening chores, and work. But I know, I say that every month. It's always hard for me to get my Christmas Cards done every month, it seems I'm never done till the last day of the month. But, that is exactly why I play the challenge: because I'd never have the time to make fifty cards during the Holidays! LOL! My first card I actually cased from Pinterest. You can see the original card HERE. I didn't copy her exactly. I just liked the way she cut out the image and put a doily behind her. I didn't add any where near the detail or layers that she did. 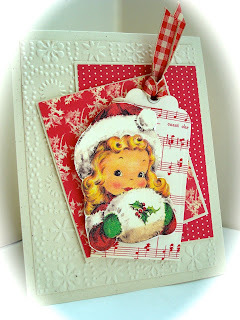 Not that I didn't LOVE her card, it's just not me to layer or embellish so much. I don't have the patience for it. I sprayed all four Crafty Secrets images with a shimmer mist so they look really pretty and sparkly in real life. Here is my second card: All the poinsettias are pre-purchased primas. 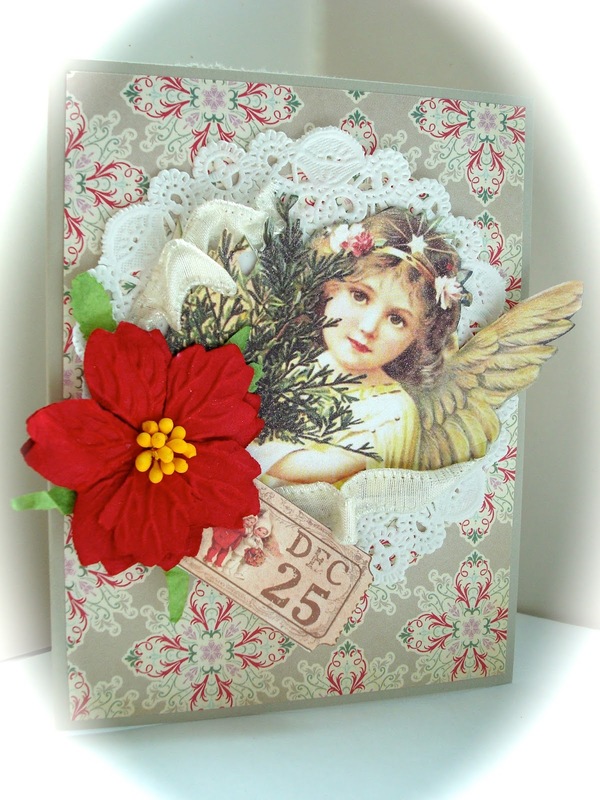 The paper which borders the main image is gold glitter paper and this poinsettia has red glitter on it. So combine all that glitter with a sparkly gold ribbon and bow and you have one shiny, shimmery card! My third card uses a sketch from The Deconstructed Sketch no. 93. The holly leaves are artificial and the white snowflake behind the flower was crocheted by a friend that she sent me inside a card last year. I think I'll send this card to her this Christmas so she can see how I used her artwork. 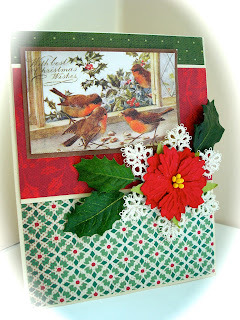 And finally, my last card uses an image by Splitcoaststampers (SC430). I was inspired by THIS tag. I embossed the creamy background with a Cuttlebug folder. Superb cards, with nice images and colors, very nice work my friend ! Aw!! Sweet and beautiful cards!! I love the vintage flair!! Awesome Christmas cards!! Ooooh Amy I love them all in their old fashioned elegance, those vintage images are just so wonderful!